Slender, stylish and ideal for the space-saving user, the maximum width of the panel is only 3cm at the back and has a narrow 1.7cm bezel. It also has touch sensitive controls and is finished in the latest glossy-black. As with all the new iiyama displays it is Energy Star 5.0 qualified, uses less than 1W in standby and typically only 13W when the Eco-mode is activated. 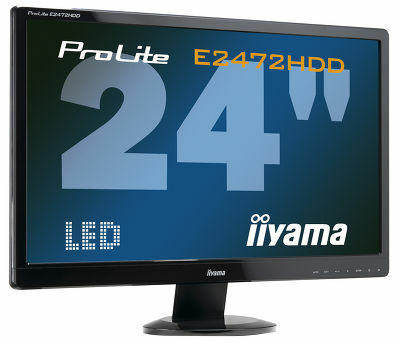 LED-backlit technology also improves image quality and sharpness and here the E2472HDD is no exception. With full16:9 1080p High Definition, 1920x1080 resolution, 5,000,000:1 ACR and fast 2ms response it proves excellent sharpness in high definition video and gaming. Triple input connectivity rounds off the high specification plus Fully Plug and Play VESA DDC2B compliant and comes with 3 years ‘on-site’ Advance Exchange Warranty as standard.